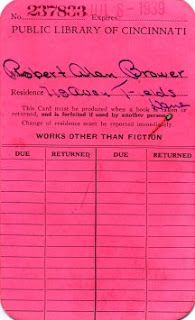 I’ve added a few more items to my collection of vintage library cards which are shown below. 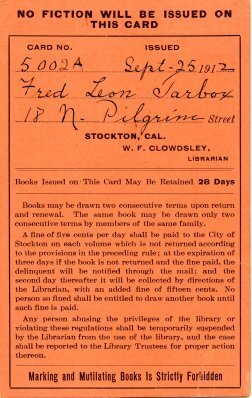 For more vintage library cards see a previous post and the page on my website devoted to vintage library postcards. I’ve written several previous posts about Melvil Dewey and his Lake Placid Club. I’m writing another one because of the acquisition of a postcard mailed to Florence Woodworth at the Lake Placid Club in 1903 (see above). 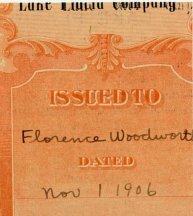 Florence Woodworth was one of the female librarians who were closely associated with Dewey throughout his life. 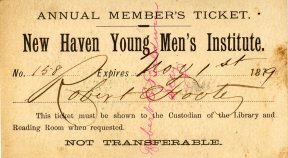 Woodworth first came into contact with Dewey as one of the students at the library school he established at Columbia University and which was later moved to the New York State Library in Albany, NY. 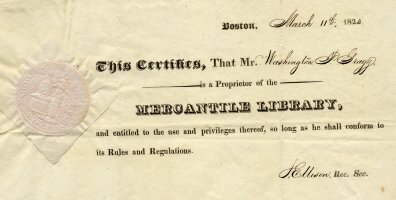 Woodworth was employed at the New York State Library in several capacities and held the title of Director’s Assistant for a number of years. She was a boarder in the home of Dewey and his wife in Albany. 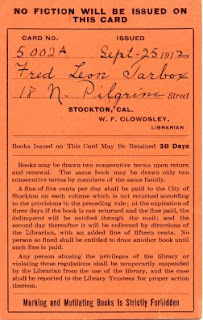 One of her special assignments included serving as one of the librarians for the Woman’s Library at the World’s Columbian Exposition in Chicago in 1893. She was also in charge of creating the ALA exhibit at the Paris Exposition of 1900. Woodworth was a regular guest at the Lake Placid Club created by Dewey and his wife in Lake Placid, New York. 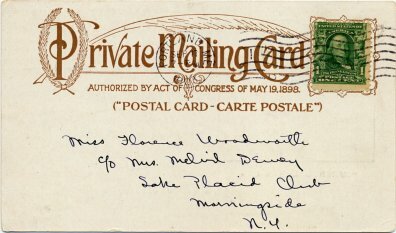 Note that the postcard above is addressed to Morningside, NY which is the name that Dewey gave to the side of Lake Placid where the club was located. 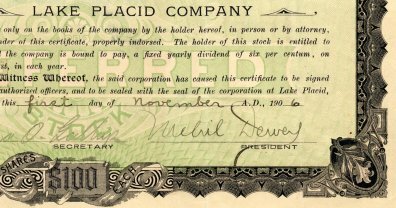 Woodworth was a stock holder in the Lake Placid Company, and I have a fragment of a share of stock in the Company held by her (see below). Someone evidently cut out the fragment for Dewey’s signature. An interesting account of the history of Lake Placid can be found on this website. In his biography of Dewey Irrepressible Reformer (ALA, 1996) Wayne A. Wiegand provides an excellent account of the creation and workings of the Lake Placid Club and the Lake Placid Company.